Kale is a vegetable that is loaded with nutrients. Some people say it’s a SUPERSTAR. It has lots of beta carotene, and vitamin K, and vitamin C and calcium, too! Kale is easy to grow and in colder temperatures a light frost will produce especially sweet kale leaves. 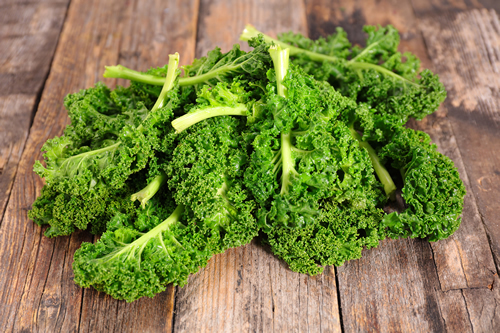 There are several varieties of kale; these include curly kale, ornamental kale, and dinosaur kale, all of which differ in taste, texture, and appearance. Curly kale has ruffled leaves and a fibrous stalk and is usually deep green in color. It has a fun flavor with delicious bitter peppery qualities. What, you never had kale chips? Oooooooh, you’re missing out! 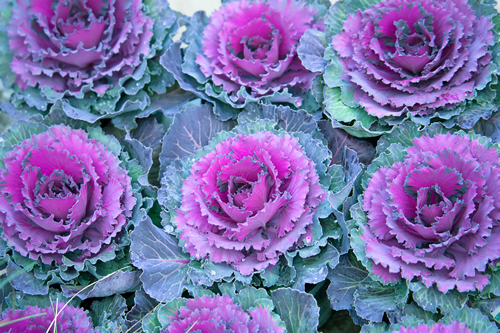 Ornamental kale is the newest cultivated member in the kale family. Its leaves can be green, white, or purple and its stalks come together to form a loosely knit head. Ornamental kale has a more mellow flavor and tender texture. This was first grown commercially in California in the 1980s. It was originally used as a regular garden plant because of its colors. It was brought to Europe about 600 B.C. and was an important crop during ancient Roman times. Peasants ate it during the Middle Ages. And then… we got it! 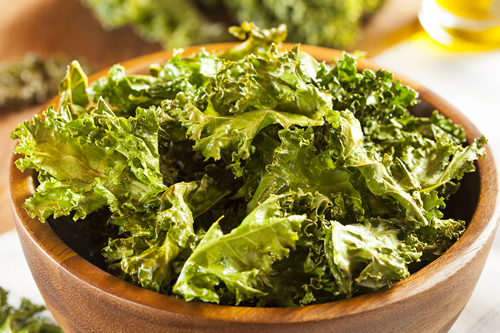 Kale came to the United States in the 1600s and it was brought here by English settlers. In the Netherlands, it is used in a traditional winter stamppot dish called boerenkool, which is a mix of kale and mashed potatoes, sometimes with fried bits of bacon added to it, and usually served with rookworst (“smoked sausage”). In Ireland, kale is mixed with mashed potatoes to make the traditional dish colcannon. It is popular on Halloween when it is sometimes served with sausages. Small coins are sometimes hidden inside as prizes. What fun! A variety of kale, kai-lan, is a popular vegetable in China, Taiwan, and Vietnam, where it is commonly combined with beef dishes.In Japan, kale juice, known as aojiru, is a popular dietary supplement because of its healthy properties. In Brazil, where it was introduced by the Portuguese, it is an indispensable side dish for the national stew, feijoada. Kale is also eaten throughout southeastern Africa, where it is typically boiled with coconut milk and ground peanuts and is served with rice or boiled cornmeal. Hmm, this sounds yummy! 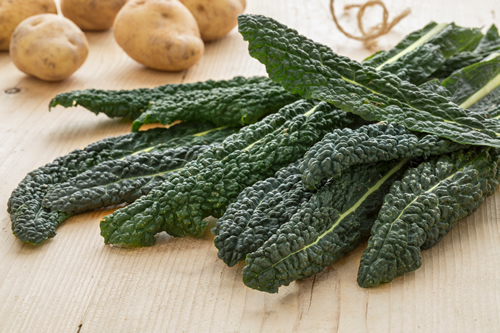 In Italy, kale is part of many popular dishes, such as casseula (pork stew), polenta with kale, Parmesan cheese and olive oil and pizzoccheri, buckwheat tagliatelle served with kale, melted Fontina cheese and potatoes. A whole culture around kale has developed in north-western Germany. Most social clubs of any kind will have a Grünkohlessen or Kohlfahrt (“kale tour”) sometime between October and February, visiting a country inn to consume large quantities of kale. Most communities in the area have a yearly kale festival, which includes naming a Kale King or Kale Queen. Hmmm. Think they wear kale on their heads? Curly kale is used in Denmark and southwestern Sweden to make a dish that is commonly served together with the Christmas ham. The kale is used to make a stew of minced boiled kale, stock, cream, pepper and salt that is simmered together slowly for a few hours. In Sweden, it is also commonly eaten as a soup, with a base of ham broth and the addition of onion and pork sausages. In Scotland, kale provided such a base for a traditional diet that the word in dialect Scots is synonymous with food. To be “off one’s kale” is to feel too sick to eat. In Montenegro, kale, locally known as rashtan, is a favorite vegetable. It is particularly popular in the winter, cooked with smoked mutton and potatoes. And where is Montenegro, you might ask? It’s a country in Southeastern Europe, with a coast on the Adriatic Sea. If you ever visit there, be sure to ask for rashtan, and then eat it like a pro! In the Southern United States, kale is often served braised, either alone or mixed with other greens, such as collard, mustard, or turnip. Yums! When you go to the supermarket or the farmers market to buy your kale, look for bunches with firm and deeply colored leaves and strong stems. You want to see pretty leaves. No browning or yellowing or even tiny holes. Smaller leaves are more tender and have a more mild flavor. You can usually find kale all through the year, but the best time is from the middle of winter through the beginning of spring. Since not all vegetables are available fresh during the winter, kale is a treasure! Kale will stay fresh in your refrigerator for about 5 days to 1 week if you store it in a plastic bag and get as much air as you can out of the bag. Please don’t wash it before you store it!It will go bad faster once it touched water. There are so many recipes for kale that it will make your head spin. You can start easy by just preparing it as you would any other green and pop it into a salad. You can also mix it into a smoothie for a real nutritional kick in the morning. You can drop some onto a pizza or into your pasta. You can even put some in a hamburger (just mix it in with the meat), or onto your tacos or your chili. You’re boosting your intake of health every time you do this. Now, how about those kale chips? If you bake it, and use the curly kind, it will taste even better than potato chips. Imagine that. 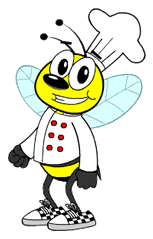 Here is how you do it: Preheat the oven to 275 degrees. Remove the kale from the stems and cut it into 1 1/2 – inch pieces. Then place them on a baking sheet and drizzle with 2 tablespoons of olive oil. Sprinkle some sea salt on top and let them bake until they’re crisp. After 10 minutes turn them over and bake for another 10 minutes. You can even try this on the barbecue. When they’re hot and tasty you can eat them as is, or use them to dip some yogurt or applesauce or hummus. To conclude this…kale is pretty awesome! Can we hear a KALE YEAH? !